Climate change has evidently increased the frequency and intensity of climate induced natural disasters (CINDs) like drought, flood, cyclone and hurricane in various parts of the globe. Among these CINDs, drought is considered by many to be the most complex but least understood affecting more people than any other hazard. Reducing the level of drought vulnerability is the major goal of drought mitigation policy and planning. Identifying the vulnerable groups and regions and unfolding the causes of their vulnerability are essentially required for devising an effective drought management policy. 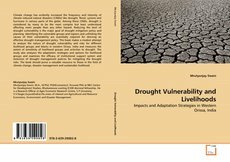 This book makes a modest attempt to analyze the nature of drought vulnerability and risks for different livelihood groups and blocks in western Orissa, India and measures the extent of sensitivity of livelihood groups and activities to drought. The study also analyzes the adaptation strategies and options for livelihood groups and examines the efficacy of institutional support system and evolution of drought management policies for mitigating the drought risks. The book should prove a valuable resource to those in the field of climate change, disaster management and sustainable livelihood.